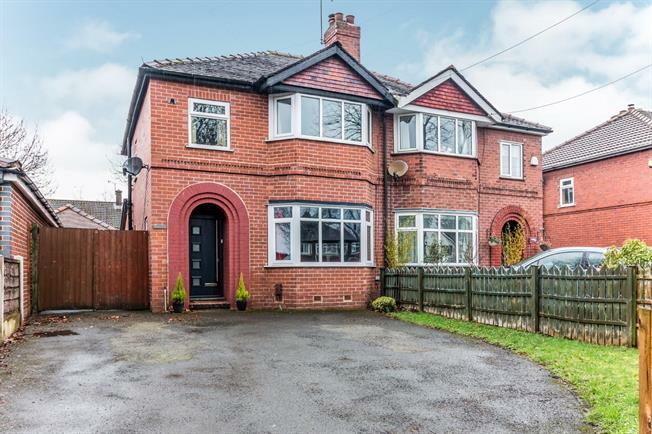 3 Bedroom Semi Detached House For Sale in Sale for Offers in excess of £325,000. This is an example of what style, creativity and sophistication should look like within a home. This three bedroom semi-detached consists of a hallway, downstairs w/c, lounge with bay window, a superb modern open plan fitted kitchen with integrated appliances and stunning bi-folding doors leading to the rear. To the first floor are three bedrooms with the master bedroom and second bedroom benefitting from bay windows. The bathroom and fully fitted 3 piece suite. Externally a driveway with ample parking to the front whilst to the rear, a garage and a lovely private rear garden. Front , opening onto the driveway. Double glazed uPVC window facing the side. Radiator. Double glazed uPVC bay window facing the front. Radiator and wood burner, carpeted flooring. Bi-fold double glazed door, opening onto the garden. Radiator, boiler. Built-in, wall and base and island units, one and a half bowl sink and with mixer tap, space for, range oven, space for, gas hob, overhead extractor, integrated dishwasher, integrated. Double glazed uPVC bay window facing the rear overlooking the garden. Radiator, carpeted flooring, built-in storage cupboard. Double glazed uPVC window with frosted glass facing the side. Heated towel rail, tiled flooring. Low level WC, panelled bath with mixer tap, shower over bath, semi-pedestal sink with mixer tap.